For quite a while I’ve been looking at different compact size thrower lights (under $60) to find the best combination of distance and pocket-ability. I’m only looking at side switch lights. It has about the same range as the others but it’s the smallest size. And even more compact having the thinner 18650 tube. I’m leaning more and more towards the D1S. All/any input and discussion is welcomed. Pay attention to the time the turbo flashlight goes into a lower state and how much power it has then. UT02 runs 180 seconds and falls down, but you can turn it back on in the turbo. In addition, in turbo modes, you can turn on the turbo without descending. IMO, you can’t go wrong with the D1S. I love everything about mine. +1 on the emisar, I wouldn’t describe it as particularly pocketable though. Ramping user interface is excellent. UT02 is the one I would pick and quite cheap with coupon applied. Good point about the step down, yes need to consider. I’m not completely sure but I think the D1S can keep up with that 3 minutes of the UT02, plus it’s user-adjustable in the firmware. “it might not activate on the D1S at all, because the host is almost perfectly tuned to handle the heat on turbo without getting too hot. Thanks for pointing out. I didn’t look into it in the review, just comparing Mfg. specs. first, but I had a good feeling it was over rated. Another vote for the D1S. Hard to beat that UI and the quality. I’m pretty sure at one time there were deals on it for around $30, now I’m seeing around $40, if you know the lower deal can you post a link to the deals thread? Also why the UT02 over D1S? It’s probably going to end up being between the D1S and UT02. Catapault V6… hasn’t a NW option and almost double the price. Maeerxu M8… the UI may not be good, ramping only (slow) and no pre-set group. It has better feature like 26650, USB charging, batt low indication on switch and XHP35 HI. Ya, nowadays its price stay around $40, very close to D1S. But its feature is much superior in my opinion. But I don’t configure FW much, I just use the flashlight. Design wise I think UT02 is more handsome too. UT02 is better for me because it has a better battery, longer working time, quality of finish, USB charging, the ability to work in turbo without going down, voltage stabilization so practically constant output level. You do the R100 mod and you have a small sweeper. Hmmm, UT01 and D1S are the same price. UT02 bigger – longer and fatter head. 26650 makes it feel less compact in size, but provide a lot more runtime. USB charging I don’t need, but could come in handy on camping trip for instance, to charge from vehicle. I need to know why XHP35 HI is better than XP-L HI? Lumen output is the same on UT02 and D1S both 1300lm, does it have more spill beam? Well you could build one, convoy c8 host 11 dollars, fet driver 7 dollars. Xpg2 dedomed 6 dollars all from rmm. Add a couple dollars shipping for around 30 dollarsish you have a 700+m pocket thrower that won’t step down unless you want it to. At least UT02 is not overdriving XHP35 HI to get that output, I think I measure about 12.6V of Vled for its Turbo mode. I don’t have D1S, I am not sure its output is sustainable to drive XP-L HI for that output. Yes I’m going to have some fun doing that eventually, I already have most of those parts. But right now I want to try a compact side switch thrower – stock off the shelf. Planning on XP-L HI w/FET driver and XHP35 HI w/boost driver for these. I already have a few FET/DD drivers w/Dr. Jones guppydrv. I’d love to see a photo of the D1S along side a UT02, looked around a while but haven’t found one yet. I bought UT-02 last December and the quality was way lower than my first, half year earlier. USB cover is very flimsy. Once I dropped it on gravel when twisting the light to mechanically lock it. The first and the second are easily repairable. The last one is actually the most severe and I don’t have a fix for it. Overall I still love this light. My first was stolen and decided to buy another rather than Emisar. But considering the quality drop and the price hike (it’s roughly as much as Emisar now), I would probably trade USB charging, constant-current driver and better battery capacity for better host quality, better UI (I actually like that of UT-02 but Emisar is better) and lighter / more compact body. The head sizes are fairly similar for UT02 and D1S. What benefit is there in having thinner 18650 tube behind such a wide head? Neither are particularly pocketable. I would much rather have extra run time of 26650 in a light with that form factor. The UT02 form is my favorite modded, I have put just about every emitter you could put in the UT02 from MT-G2 XHP70.2 XHP50.2 XP-L HI XP-L W2 (domed/de-domed) and an old school de-domed XP-G2 pulling 6.3amps. With Lexels T/A 30mm drivers and Narsil UI and lighted switch. I run 2×26350’s for the XHP’s and run 26650 26700’s 21700’s and 20700’s in the other 3v emitter lights. I was never happy with the stock UT02/XHP35HI but with Lexels 1S boost driver at 3amps, I have one stock UT02 sitting here waiting on this driver. The D1S might look shorter though since it’s position is in front of UT02, but that does give an idea of the size difference. Maybe have a look at the Haikelite SC01 .I don’t have one but 2000lm turbo from XHP35 Hi,,with thermal regulation,26650 with usb charging,135mm long,40mm head,under. $35.Anyone know more about it? I do realize these are not quite pants pocket sized lights, was thinking more of jacket/vest side pocket. So basically which of the lights fits smaller in the hand for that. The D1S seems to be a good bit smaller overall. True about the battery capacity for extended run-time, and the D1S does kind of look odd or unbalanced, the short thin tube with the large 50mm head. I’m going to have to look to some reviews to find actual kcd measurements, what benefit for a nearly a 10mm wider head if the throw distance is slightly less, not more? And real good point about the upcoming Lexel 1S boost driver. So now I need to find some actual measurements of the others too. Not that it matters a lot but I find it to be unappealing in looks, uglier than D1S I think. I’m not certain, but I think I recall a review which measured the M8’s throw closer to 600m… IMO, you can’t go wrong with the D1S. I love everything about mine. I’ve got them both with same emitter option. 4000k I like them both. I haven’t had the time of late to run the numbers and do my comparison shots but when I had them both out to the lake a very cold night not long ago, it looked like the D1S out threw the M8 slightly. However the M8 did not get nearly as hot like the D1S did which was nice. If that’s due to a weaker thermal path, or simply the larger mass of the M8 we’ll see. I like the 26650 size and cell options for run times vs the D1S. The UI of the D1S seems more polished than the UI of the M8 also, but I have plans on doing some stuff to the M8 to make it more to my liking. Just throwing my 2cents in the mix regarding my feelings towards both of those options. The Maeerxu M8 is nice. Neutral tint, lighted side switch, on board usb, high quality machining. 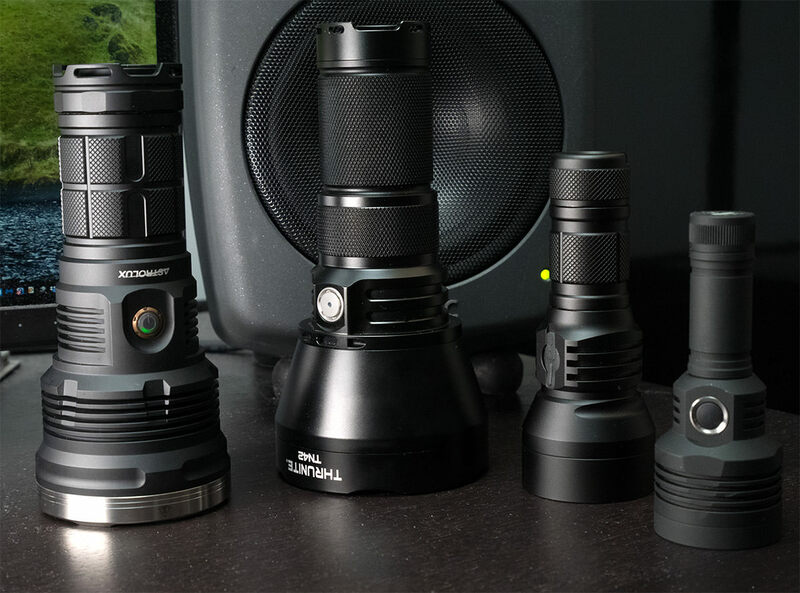 Some think the Maeerxu might be made in the same factory as the Emisar lights. I don’t doubt it for a minute. Materials are virtually the same, build, and anodizing is very similar. Even the thread shape and pitch is identical.